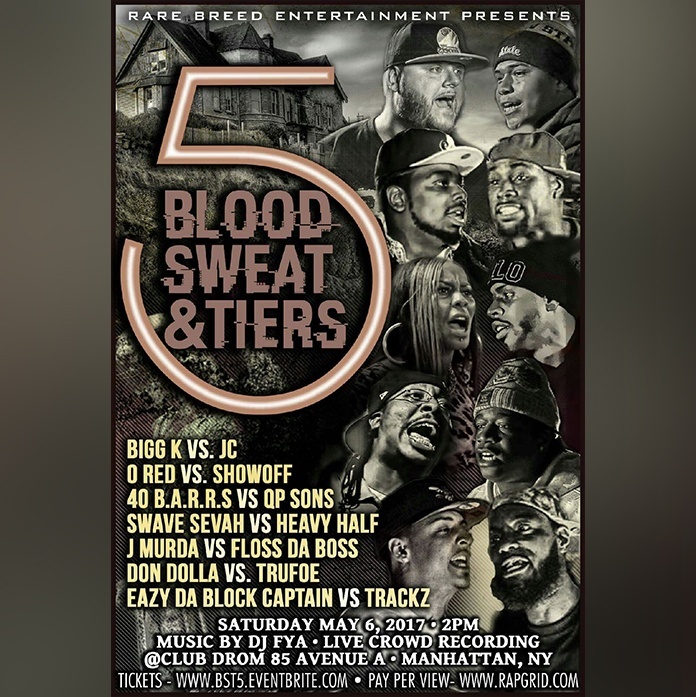 Blood, Sweat and Tiers has long been one of the most heralded event series’ in battle rap, producing a litany of strong and re-watchable battles. On May 6th, they’ll be presenting the latest in the series, with Blood, Sweat & Tiers 5, and this is one that can compete with any of the previous iterations in terms of potential. In the main event, and what has the potential to be a battle of the year candidate, Bigg K takes on JC. Over the past several years, Bigg K has been one of the most dangerous opponents for any battle rapper, his hard-hitting, punchline-heavy style catapulting him to being among the best in battle rap. This is a comeback of sorts for K, who hasn’t battled in almost a year, his last outing being a KOTD battle against Cortez which has not been as well received as we have become used to. JC’s last appearance on RBE was a really dope battle against Craig Lamar, where both guys acquitted themselves very well in a very strong, borderline classic battle. JC can really never be counted out of a battle, because one would struggle to think of a bad performance that he’s had. The guy is simply the model of consistency in battle rap, and in that way, poses a very interesting challenge for K. JC is going to do his thing, and he’s going to do it well. I know i better get a #MASS3 call from @OrganikHipHop or I'm shooting that shyt up lol.. This increased activity is good for any fans of Red, and he should be looking to make a splash here after having a solid, debatable battle with the aforementioned Ave. His opponent, Showoff, never seems to have an off day on the RBE platform. Already the owner of an impressive battle resume, Showoff will seek to add another top name to his body count. 40 B.A.R.R.S, one of the finest female lyricists in the world, takes on QP, one of the best male writers in the game. 40 is coming into this battle with a good deal of momentum, her last battle being against Big T, where most feel that she comfortably took the W. QP presents a different challenge, however. QP very much has a formula, but there is arguably nobody who does that formula better. In every battle he will hit his opponent with a barrage of schemes and wordplay, and on the 12th watch you'll still be catching new things that you missed in there. 40's also a talented writer, but her approach is more straight-forward than QP's, which could easily allow her stuff to hit much harder. Among some segments of battle fandom, female emcees are not given the same respect as their male counterparts, so back to back wins against Big T and QP could provide even more evidence that the top ladies can easily compete with the men.